Place the eggs in a large saucepan and add enough cold water to cover by 1 inch. Bring to a boil. Remove from heat, cover, and let stand for 12 minutes. Drain the eggs and run under cold water to cool. Peel the eggs and cut in half lengthwise. Transfer the yolks to a small bowl and mash with the mayonnaise, lemon juice, mustard, seafood seasoning, and ¼ teaspoon each salt and pepper. Fold in half the crab. 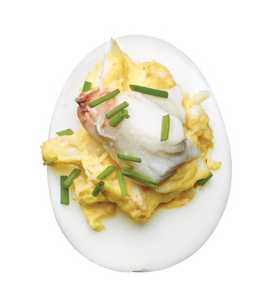 Spoon the crab mixture into the egg whites, top with the remaining crab, and sprinkle with the chives.